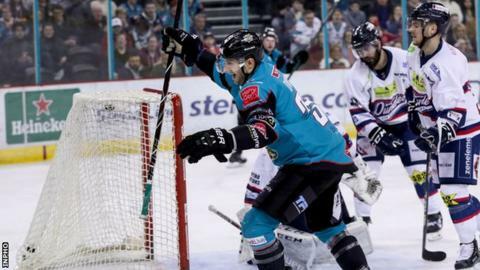 Belfast Giants forced the Elite League title race to the final day with a 6-4 win over Dundee Stars. However, Cardiff's 9-1 thumping of Milton Keynes means the Giants have to hope that the Welsh side lose their final game on Sunday. Darcy Murphy and Kyle Baun hit doubles while Jonathan Boxill and Patrick Dwyer also netted in the win over Dundee. It keeps the Giants top of the table but without the luxury of having their destiny in their own hands. The Giants started quickly, taking the lead after only 52 seconds when Blair Riley laid the puck off to the onrushing Murphy and his wrist shot beat Stars netminder Pontus Sjogren. Charles Corcoran equalised for the visitors at 5:57 but a quick double-strike for the Giants appeared to put them in control. Both goals were similar - the first saw Sjogren spill the puck from a Dustin Johner shot into the path of Boxill and then, 38 seconds later, Baun's effort also came off the body of the Stars goalie and the Giants forward pocketed his own rebound to make the score 3-1. However, Dundee weren't about to throw the towel in and they capitalised on a couple of poor turnovers from the Giants in their own zone to tie the game up before the end of the first period thanks to goals from Matt Marquardt and Jordan Cownie. Murphy's second of the game and 49th of the season, a shot similar to his first effort, edged the Giants in front again at 27:47 but once again they were pegged back before the second intermission with another goal from Corcoran. With Cardiff taking care of their business against Milton Keynes the Giants knew they had to find a way to win the game in the final period to make the game on Sunday between the Devils and Coventry mean something. Dwyer's close range finish at 46:46 from Murphy's assist put them back in front again. With Dundee's play-off hopes dangling by a thread the action became frenetic, with both sides looking nervous and making mistakes. The Stars hit the post and forced Tyler Beskorowany into two big saves in the closing minutes but eventually Baun's empty netter secured a final regular season win of the season. but whether it will be enough remains to be seen.